Obsessed with Scrapbooking: New Giveaway+Michaels, Joanns, Hobbly Lobby and ACMoore Coupons! 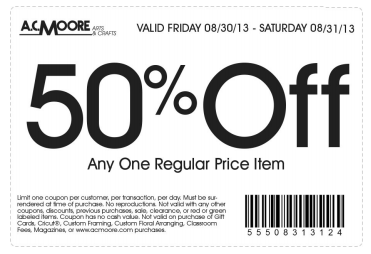 New Giveaway+Michaels, Joanns, Hobbly Lobby and ACMoore Coupons! 1) Leave a comment below - Have you started on your Christmas cards? Winner will be announced on September 1, 2013 and has two weeks to claim prize. U.S. Residents only, please, over 18. Void where prohibited. Congratulations, Jill! Please email me within two weeks at joyster110@gmail.com with your name, address and what you won and I'll get that sent out to you. 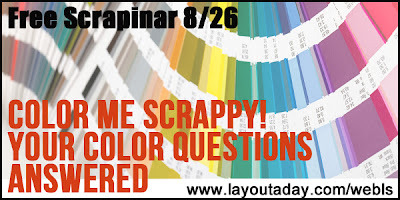 I wanted to let you guys know that there is another FREE scrapinar from Lain Ehmann coming up tomorrow, August 26. Register for this FREE webinar by clicking HERE! I have enjoyed this designers items the most of all my cartridges! Joy thanks for the chance to win this new cartridge!! No I haven't started Christmas cards I just don't want to think about Christmas! I love halloween scrapping it is so fun so that is what I am working on now. Fingers crossed! Yep, about two months ago, but then discovered 3-d svgs and kinda got sidetracked! That cartridge looks adorable! I have a few leftover from last Christmas, but I need to make more! I've started getting the supplies to make my Christmas cards, but haven't started making any yet. Love the new cartridge-thanks for the chance to win! Thanks for the opportunity to win this new cartridge. Love all your samples and how to videos. I have been thinking about starting my Christmas cards...does that count. Actually now that I see it in print I had better do something about it! Thanks for the push. Great cartridge. There is soooo much you can do with this one. Thanks for the opportunity to win this. Christmas is arriving way to soon but I have been trying a couple ideas to see which one I like best to make for the year. I have started my Christmas cards only in my dreams. The dreams are starting to turn into nightmares so I guess I better get busy. Time goes by way too fast. Thanks for the chance to win this cart. Not yet but soon - thanks for the opportunity to win this cart. Love to win...this cart is on my list!! Yes I've started my Christmas cards!! Thanks for a chance to win this cartridge. I have started Christmas cards with 52 Christmas Card Throwdown but got busy with other more urgent projects so am a little behind. I have not started my Christmas cards, but that is on my list of things to do this week! Ha....nope I am not organized enough to have started my Christmas cards yet!! Thanks for the chance to win Create A Friend. Do you have one? I hope so because I would love to see the cute things you will make with it!! Thank you so much for this giveaway. I'd love to win it. Also, thank you again for the coupons. I used them every week. Thanks for the contest. I would love to win this one. Thanks for a chance to win the cartridge. I have started my Christmas cards and hope to do more this week. Not yet but I have started my Halloween decorations. I love your giveaways. Such a cute cartridge. Can't wait to Create a Friend with this. thanks for the chance to win. what are these things you call Christmas cards? Thanks for your awesome giveaways and excellent ideas!! I'd love to win the Create a A Friends cartridge - I would be so exicted to see what I could do with it and the new Artbooking cartridge too. Hmmmm - now I have two new cartridges on my wish list. Yes. I created my first Christmas card this week. 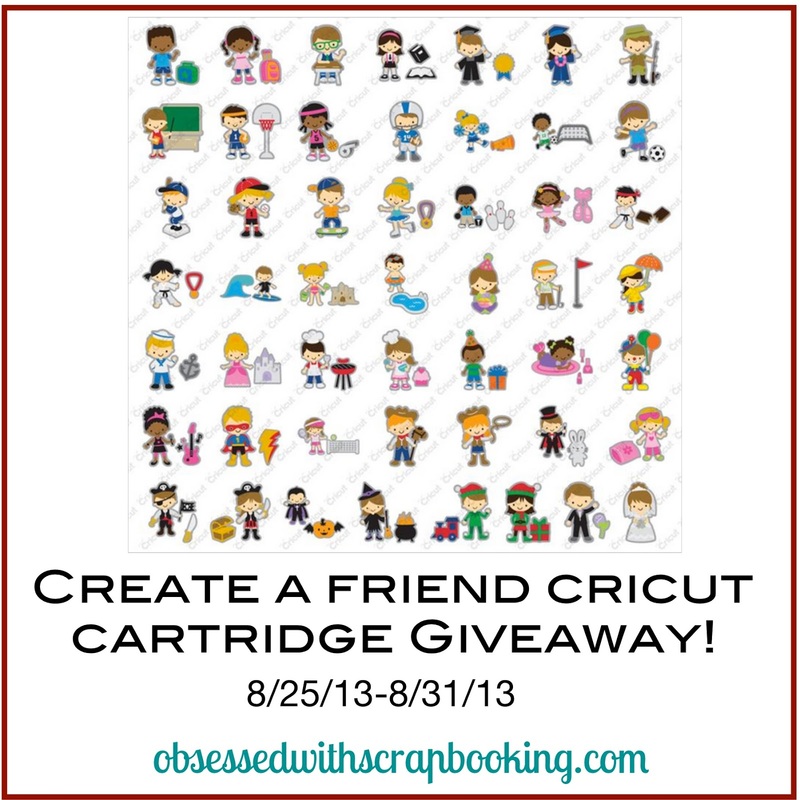 I love this new Create A Friend Cartridge!! Just adorable! I can think of all kinds of possibilities for creating with this one. Thanks for the opportunity to win!! Jus think of all the cute cards and layouts you could do with this! I've not started my Christmas cards. I normally do that the first week of November. I love this new cartridge it is on my wish list! Thanks for the guilt trip on the Christmas cards, lol! I was just thinking the other day that I really should have gotten to work on them this summer before school starts back up! Looks like a cute cartridge. Thanks for the chance to win! I have not started my Christmas cards yet, but I do know what I am making. That is the hardest part. I love this cartridge and my grand daughters would really love it. Thanks for the chance to win it. Christmas!?! Oh Man! Actually, I have the papers and bases, but am still planning (in my mind) how I want them to look. I have a large family who look forward to my cards, and I try to put together sets for a cute little boutique here in town....we shall see how far I get! 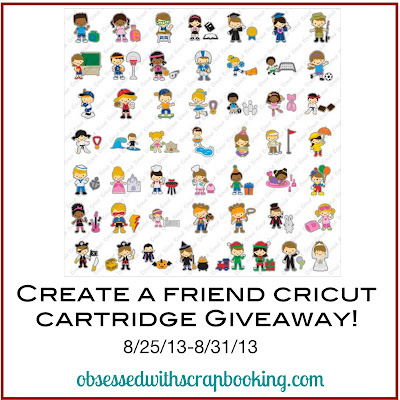 Create a Friend looks like a cute little cartridge, might be a fun one to get to make paper dolls for my granddaughters. Thanks for a chance to win it! I started my cards in June and I'm almost finished with them. I just make a few at a time. I love not having to hurry and make them just before the holidays! I haven't started yet. I will be starting them at the crop I'm attending in September. Create a Friend cartridge looks adorable and so versatile. Love you blog, I have got tips and ideas for you. Thanks for all the great videos, love them. Haven't started my cards yet, but just got the Simple Holiday Cards cartridge and can't wait to start! Yes I have started my cards - all 300 of them! I make cards for my husbands work so I have to start early. I pick several designs and make about 25 or so of each - it got boring to make just one design, so years ago decided to make them all different. I love Christmas cards! I have never posted be foe so I hope it is going to work. But I all ways read you newsletters and love whath you do with CTMH. I love, love the card cartrage it woul sure be nuce to have that one. Ohmygoodness, Joy! I love, love, LOVE Nancy Kubo!!! :) I thought I was going to wear out Create a Critter, because I used it so much! ;) Those little "friends" could not be any CUTER!!!!!! Thank you so much for having so many wonderful giveaways! I really thought that I would start my holiday cards earlier this year (I always say that I'm going to do Christmas in July), but I guess it's my tradition to make 150-175 handmade cards the week before Christmas (I don't get much sleep or do much of anything but craft during what ends up being the 3-4 days before). But every year, as i put those cards in the mail on December 24th, I promise myself that next year will be different-lol! Anyway, thanks for always having the crafty coupons in 1great place &thank you for the chance to win!!! Hi I have been thinking about a Christmas Card design but have not settled on one yet. 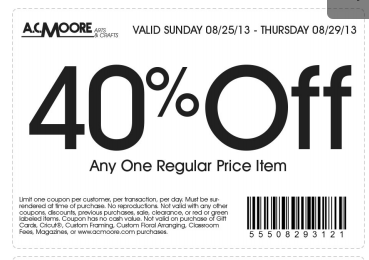 I enjoy your blog and appreciate you posting the coupons each week. Thanks for the opportunity. Love your videos and all the inspiration. Thanks for the chance to win this new cartridge! Starting Christmas cards in August? Sounds like an awful lot of work. I applaud you!!! I would love to make all my cards but I know that I would never stick to it. I really need to find a Christmas cart that I like and maybe that would inspire me. Congrats Jill enjoy your new cartridge. 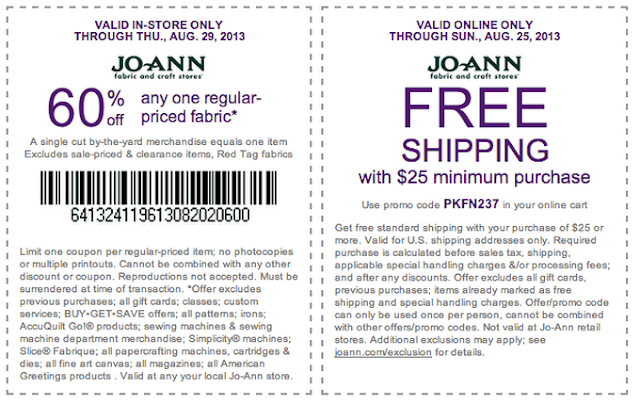 Thanks Joy for the awesome coupons you know how to spread the "JOY" 4 sure!! I have Christmas cards to sell but none for family and friends. I need to find a card that can be mass produced. Love all your ideas. I have started my Christmas cards after seeing so many ideas during Christmas in July. Thank you for the chance to win this new cartridge. First year at making my own Christmas cards. Thank you for a chance at winning another contest. Your the best!!! What a giveaway! Love this cute cartridge! Your video's and showing the pages where the images are, are really helpful. Does thinking about it count? So new to all of this !!! Your give a ways are a BIG help, and love your videos. Looks like a really cute cartridge. Would love to win it. Thanks for the chance! I am working on Christmas cards all year. Collecting designs, ideas and cartridges for the big assembly! Love Christmas all year round. I have been playing Christmas music too!! Gets you in a happy mood to craft! Thanks for the great give away! Christmas cards? Nope! Last year I didn't even make them, for the first time in several years - sent out photo cards. Even when I did make them, I never got started until after Thanksgiving. Now I will only make a few - to family and friends I know won't be tossing my hard work in the trash after New Year's! And yay for this awesome giveaway! I always make ornaments for christmas and need to start thinking of what I will do this yeear. This cartridge will be a big help with my Christmas Cards! Thanks for holding this contest. Thanks for another chance to win something cool. Love your goofy personality!!!! I'm actually starting the cards this weekend. The holidays will be here too soon! Thanks for a chance to win this super cute cartridge! Thanks for the chance to win. I would love to have this new cartridge. Don't even want to think about Christmas cards until there is snow on the ground. I haven't started yet. We have just moved and I do not have my room set up yet. I can't wait to start. I really like the new cartridge. Thanks so much! I have ordered my paper but that's about it. I have not yet started Christmas cards, every year good intentions lead to ... no Christmas cards lol. I have not even begun to think about them! I know I am very late this year in getting going -I promised myself I would start before the end of October though - we will see!!! I order photo cards so I haven't even thought about them yet. I know I should be working on my Christmas cards but I have birthdays coming up that are requiring my attention. Thanks for the opportunity to win this cartridge. I love the cartridge . I do books for parties,friends and gifts. Yes I have started to experiment with so many good ideas. Christmas invitations that everyone looks forward to. I have too many to try. Thank you for all of your great ideas. Have a good week. In January I got some great deals after Christmas and started on some cards for this year. But then I dropped the ball. That is ok, cause I now have some new ideas and I am ready to start again. Thank You so much for the opportunity to win this cartrididge. I have the other two and love them. I am a teacher and could do so many cool things with my class with "Create a Friend". I love your blog. Thanks for all you do! This is Mary with Borott. I have plans to get together with a friend next Saturday and make Christmas cards. I've pulled out all the paper, embellishments, etc. and am ready - can't wait! lol....know I won't think about Christmas cards until the week of Thanksgiving and then want to get them al out the day after Thanksgiving. I'm cray-cray that way! Thank you for the chance to win the cart! It is cute! Christmas cards already? Good grief, I'm still working on current birthday cards! I have only two Christmas cards made so far. Oh no, that means I still have about 48 more to go! I'm gonna have to come up with a great-looking but simple card to make a bunch of! Thanks so much for the chance to win this adorable cartridge ~ just love the images on it, they're so stinkin' cute! Cute, cute, cute cartridge and thanks for a chance to win it. I'm so excited about this new cartridge!! Create a Critter is one of my absolute favorites!! Oh this is the best cartridge for grandma's, like ME! Thanks for a chance to win it. I have Create a Critter 1and 2 which are great. This would be a great addition. Thanks for a chance at winning this new cartridge. It's so darn cute. Christmas crafts, not yet. Haven't even thought of Christmas yet...TOO WARM! Would love to win this cartridge...its another good one! Thanks so much for the weekly coupons, the daily emails with so many, many wonderful creations and let's not forget your weekly giveaways!!! I have been thinking about what I'm making for Christmas Cards this year but haven't decided yet. Love Nancy's style this new cartridge is going on my wish list. I made two trial cards and decided against them, so now I am just waiting for some inspiration. Would love the new cartridge as CAC and CAC2 are my favorite cartridges. Thanks for the chance. Congrats, Jill! And thanks for the coupons, Joy. I haven't started my Christmas cards yet. Thanks for the chance to win this adorable cartridge! Have not started on my cards yet. I'm planning to go to a weekend retreat soon so may get them done there. Thanks for the chance to win this cart! I love your blog and I read all you updates - thanks for all you do. I have not started my cards yet as I am making things for 3 craft shows that I have in November. I love this cartridge and thanks for a chance of winning it. Wow, this cartridge is definately on my wishlist! Thanks for the chance to win! Sadly, I have not yet started my Christmas cards but I do have a few new stamps that I may use to make them. What a cute cartridge, I would love to be able to add this to my collection. 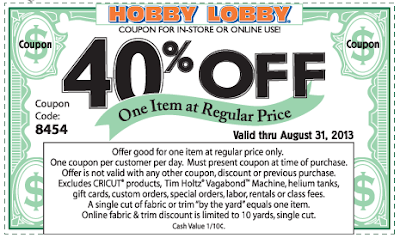 I also wanted to thank you for posting all the coupons in one place, it is nice to be able to come here for them. Thanks for the chance to win the cartridge and thanks for sharing. and would love to have it! I have started Christmas cards, but only because I belong to a group that swaps different themes every month. We did Christmas in July! No, I haven't started Christmas cards yet, but I have started school again (I teach high school). Looking forward to some inspiration on here to get me motivated! I have worked on some but still need to get a few more done, thanks for the chance to win a great cartridge. Oh, I most definitely have NOT started my Christmas cards, but I do update my address list all year long. At least that's half the battle! Love your site and I love getting your e-mails in my inbox! I am still thinking about starting my cards. I always enjoy coming up with a design for my Christmas cards and then carrying it out. I usually try to start in July. This year, we are in flux. My husband and I are moving to a different state. I am currently in one place, and my husband- with my card making supplies and cricut- are in another!! Probably store bought cards for this year : (. No, I haven't started Christmas cards yet, but it has been nagging me! Thank you for the coupons, I almost always use at least one of them. I really love the new cartridge. Would love to have it. I don't start my Christmas cards until sometime in late in November . I would really like to start earlier this year. Please motivate me! I started 6 cards for xmas just yesterday and it's from a tutorial of yours using the Child's Year cartridge with the snowman, child and bird cut out. Loved your tutorial on this. They are almost finished. I had to make one Christmas card for a Christmas in july event- but not sure I like it enough to make it my card that I will send out! This looks like a super cute cartridge, Joy! I haven't started my xmas cards yet, thanks for the reminder, I really should get going now instead of last minute as usual. Defintely thinking about my Christmas cards, but it takes me a while to finalize my plans. Thanks for all the great Artbooking videos! First thanks for the coupons every week. No, haven't even thought about Christmas yet but am working on Halloween! No haven't started Christmas cards yet, summer has been way to busy! Thanks for a chance to win this cool circut cartridge. Many thanks for getting all these coupons together. I can't tell you how much I look forward to seeing your posts every week! I haven't started my cards . . . yet. Family business to take care of . . . and, I REALLY want this cartridge! I need it to make stuff for my classroom. Thanks so much for the opportunity every week. I have all my cards ready! Thanks for the chanc to win! No I haven't started my cards but I am looking for inspiration. I usually have my idea by October and start up the assembly line. Thanks for all the coupons and I love the give-away's. Aren't you just silly! Christmas cards....just starting working on my Halloween cards. Once I finish those then HO HO HO time! Thanks for the chance to win! I haven't even thought of starting them yet, though I should!! I'm into something much worse right now...reorganizing my entire scrap room!! Thanks for the chance to win the Create a Kid cart..it would come in quite handy with the cardmaking for my seven grandchilren! I have the Create a Critter one and it's so cute!! Nope no Christmas cards here yet, I haven't had time to scrap with all the activity on a farm with harvest and all, let alone think of Christmas yet. No Christmas cards yet! Thanks for the chance to win the adorable new "Create a Friend" cart! Love your generous giveaways and it is so nice of you to collect the coupons for us each week. Thanks! Just a few! Just not in the mood yet for many ideas! I'm in Texas also, and its too hot to think about Christmas! Thanks for the chance to win such an adorable cart! Well the ideas are in my head, so that's a start. I am loving so many new icons and accessories to this new Friends cartridge. I haven't started on my Christmas cards yet, but I did get two new christmas cart. to get me started/motivated! I guess I need to get started! "know more excuse"
Thanks for a chance at this weeks cartridge! This cartridge would really help me with my Christmas cards!! lOOKS LIKE A CUTE CARTRIDGE. I would love to win it. Have s great day. Yay! I'd love to win this cartridge! Have I started my Christmas cards? No but I started some Halloween cards last night. Thanks for the chance to win! I have started gathering materials together, however, no cards yet! I do a lot of crafting, but have never made Christmas cards. Will probably not think about them until December. Thanks for the chance to win! I would love to win this cartridge. It's looks super adorable. My son starts kindergarten tomorrow and I'm sure I'll be making "friends" pages for him. This is so cute. I would love to win it. No cards started here yet !! Can't get in the mood.. I make Christmas cards every year, but never send them out. Sometimes I use them on gifts. I've narrowed it down to two different styles. Thanks for the WONDERFUL opportunity of winning this great new cartridge. I've been "gocking" over it for awhile. Can I just say I love this cart, I have not started on any cards yet! Oh did I tell you have much I love this cart...lol and would love to win it! wow Joy, this would be a cartridge that I can use for so many of my cards. Thanks for your offer to give me a chance to win. Love all you do & show....thanks also for the giveaway. What a great site you have. Won't miss it daily!!! Congrats to the winner! Oh my I would love to win this cartridge! It's super cute!! No Christmas card yet but I hope to start soon lol. I love the new Create a Friend cart it's adorable. I have started making my Christmas cards, but I think I need to step it up. I've decided to dedicate my card making to getting those ready ahead of time this year! I have not even thought about Christmas cards yet. Does that mean I'm behind? Yikes. I would love to win this cart. Thanks for the chance. I have not started making Christmas cards yet ... but am thinking of ideas! Thanks for the chance to win the Create a Friend cart! I have not started my Christmas cards as of yet. Love this new cart. Thanks for the chance to win. I just LOVE this this new cartridge! Thanks for the chance to win it! I have made a few Christmas cards. I love the new cartridge. I will keep my fingers crossed that you pick me this time. TFS! Christmas cards? I have MANY cards to make for September birthdays and events first! Who am I fooling? I'll be buying Christmas cards again this year!!! LOL. Thanks for the chance to win the new cartridge. My 9 year-old daughter and I could have loads of fun making scrapbook pages with it!! Hahah... Not started a thing.. I really need to cleanup the scrapbooking room so that I can be peaceful again!! Thanks for the giveaways! Not yet have I started making my Christmas cards. I just can't make up my mind which design to go with this year. I would love to make some new friend's with this cartridge. Ha, Ha! You must be a mind reader, I was just thinking this morning that I ought to start working on those!! I know you have fabulous ideas for them, when will you share them with us?? No I have not started working on my Christmas Cards, bu tI need to. I seem to wait to long some years, but hopefully this year will be different. Thanks for giving us all of the wonderful card ideas. Look forward to more. No Christmas cards yet. I don't send many so it's not a huge deal to wait. I'm sure it will sneak up on me (again). I haven't started making Christmas cards yet, but I'm on the look out for paper or stamps to use. I have started thinking about my Christmas card! Getting closer to having the basic idea down! I have not started my Christmas cards yet....usually not until October. I haven't even thought of my design yet! Thanks for the chance to win ! I have not started anything Christmas yet. Love all your projects! Thanks for a chance to win! Oh, how I would love to win this cartridge. It is SO CUTE! Have I started my Christmas cards? No, but I have made maybe six different samples. I just can't decide how I want them to look! I would love to win this cartridge to use at the daycare where I work with the 5-12 yr old school age kids. We have had so much fun creating bulletin boards and craft projects with cricut! This cartridge looks like fun too...as far as Christmas goes, hope to get started as soon as the kids are back in school. Thanks for the chance to win! Happy scrappin' lindy "the bakery lady"
If by "started" you include the planning stage, then yes, I know what I'm going to do and the papers to use - ha! Thanks for the opportunity to win this cart! I haven't started yet but need to soon. I love all your great ideas! Sue K.
I've been making Christmas cards for OWH but not my own personal ones yet. Adorable new cart! No, I haven't started my Christmas cards yet. Just finishing up Halloween and Thanksgiving then I'll get started. This is just the cutest cartrigde that has come out in a long time! It's a must have. Thanks Jill for the chance to win it! No, I haven't started on my Christmas cards yet. However, I have been thinking about it! I haven't started on my Christmas cards yet but should get started! Thanks for a chance at this weeks cartridge! I have started my Christmas Cards for the Operation Write Home Organization, mine will have to wait awhile, but I LOVE making Christmas cards. I also love your videos. My mom gave me a Cricut Mini , I had no interest in this machine until I started to see your videos. Now I just purchased Cricut Expression , I only have one cartridge, thanks to your videos I have learnd how to use it. I'd love to win this cartridge. Please keep making those great tutorials. I have not started my Christmas cards yet but they have been on my mind. I have started my Christmas cards. I do two different cards - one with a cat on it for the cat lovers on my card list. I started that one a while back. Thanks for the chance to win this cartridge. It looks so cute! 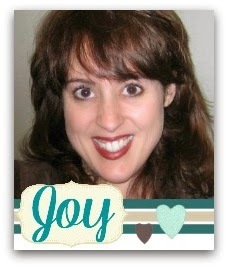 Joy you are a joy to help me stay on my toes and see all the wonderful things you make with the cartridges. I have learned sooooooooooo much! I have not started my cards yet but we had our portrait made for a new church directory and the picture was so good (we are in our 60's and that doesn't happen very often anymore!) we ordered Cards for Christmas. So I just need to start addressing them. Hope I will. Thanks for the chance to win this cute cartridge. Yes, I have started my Christmas Cards already! Also, made 3 dozen as Birthday gifts for my sister and two best friends. Would love this new create a friend cart to use on cards of all sorts. Love your stuff! Yes! I make Christmas cards all year round. My favorite cards to make are for holidays, so I just make them whenever I feel like it and then when the holiday comes, I send some of them out! No I haven't started on Christmas cards yet, still gathering ideas on what to make for Halloween! Thanks for another great chance to win a great prize! I haven't started my Christmas cards yet but I do have a plan. They'll be more detailed than what I usually do so I probably should get started on them. Thanks for the chance to win this new cartridge...I love Nancy's work. I haven't started yet, but have been doing some thinking of it!!! Won't be long. Thanks for the chance to win! Would LOVE to win this cart!!! I need to make more cards. The cart looks adorable. Thanks for the chance to win. I haven't started yet but, making cards is my favorite thing to do. I really love this cartridge and it would be so awesome to win it! I also love love your web site!! Thank you for this chance to win!! !